I arrived in London on August 2nd to a Country and family gripped with Olympic fever. It was a fabulous time to be back home as the national pride was so strong and the atmosphere was electric. I guess the home advantage really does work on the human spirit and resulted in the UK’s best results in over 100 years and ending up 3rd in the medal table. I have never felt so proud to be British and so happy to be in the UK. It was also fantastic to see my family – Owen, kids and my Mum and Dad! The kids had made a banner to welcome me at Heathrow and I was over-whelmed. Isabelle had lost a tooth while in the UK and Oliver seemed to have grown a foot! First priority – shopping!! After my disastrous shoe shopping fiasco in Beijing, I decided that I needed to stock up while I had a choice of styles and sizes! Success – 3 pairs later, it was on to finding school shoes for the kids. BISS had warned us before school broke up for the summer that it was almost impossible to find school shoes in Shanghai. I just hope that the kids feet don’t grow too much this year!! A lovely day was spent with my best friend and her family, again a gorgeous sunny, warm day. When the sun shines in the UK, it is a beautiful place to be 🙂 We spent the afternoon in the garden, where the kids all played traditional “sports day” games and got spoiled by James and Madeleine. Isabelle turned 7 while we were back home and she celebrated twice! Details to follow! Peter and Emma came to my Mum and Dad’s for a few days and we had a fabulous day out at Knebworth. All of the kids enjoyed the adventure playground, the dinosaur trail and the maze – it is a great family location. 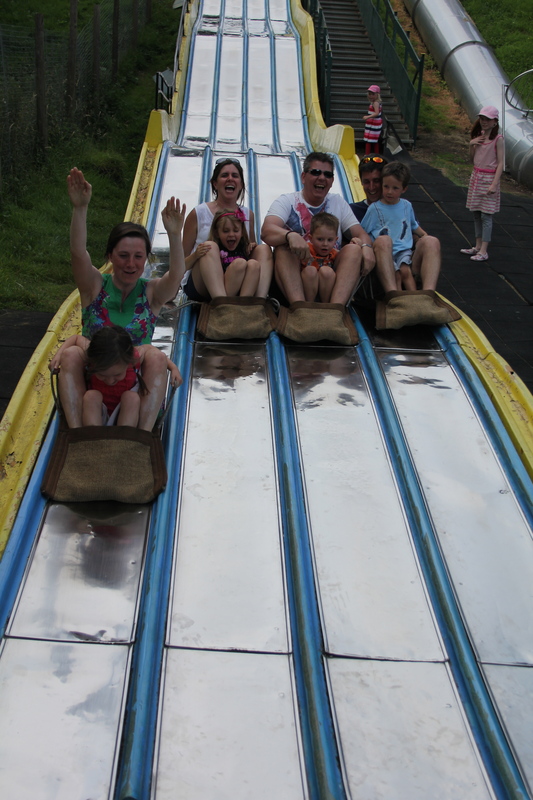 Emma & Maeve, Sara & Isabelle, Owen & Oliver, Peter & Oscar – all kids on the slide. We finished the week off with a birthday celebration lunch at a pub and met up with friends and family. Wonderful to see Jez & Caroline, Kim & Harley, Mark, Sandra, James & Madeleine for a yummy pub meal, a few drinks and more lovely sunshine. The week flew by and all of a sudden, we were packing up ready to come back “home” to Shanghai. 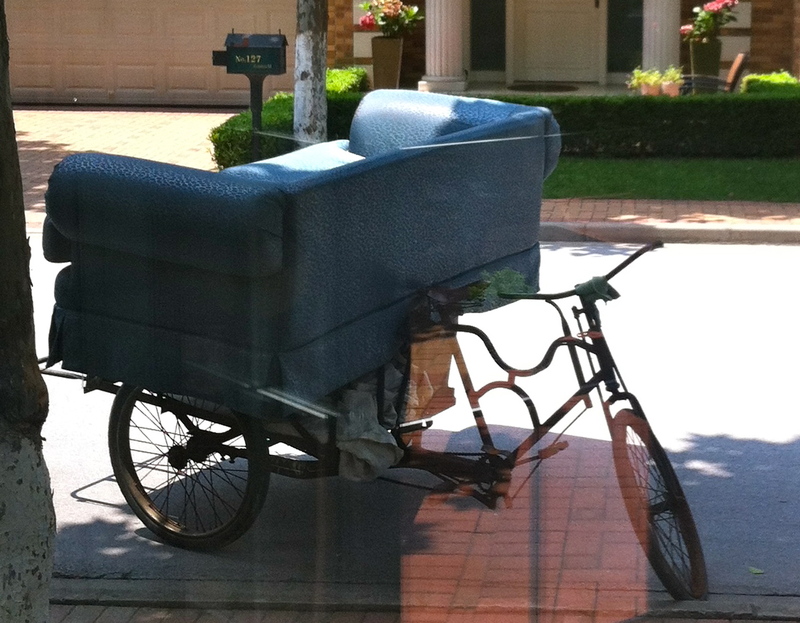 Sofa – on a bicycle! 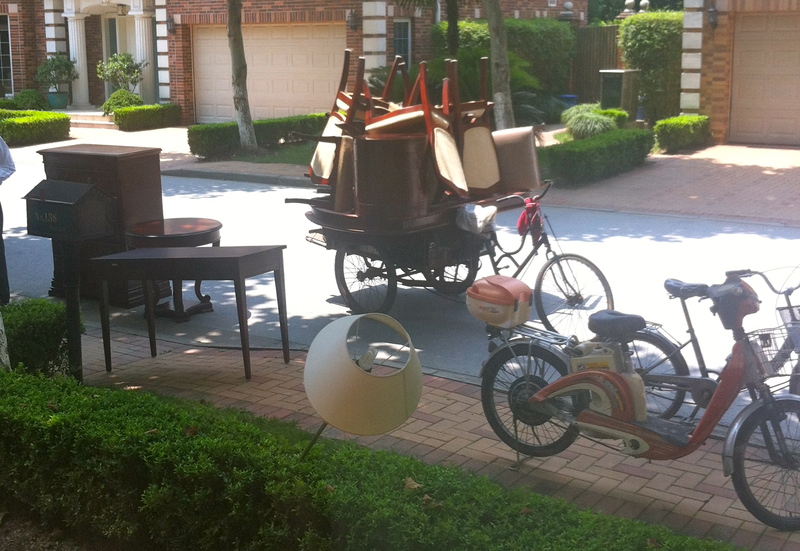 All the bicycles are lined up ready to remove the rest of the rented furniture – lamps, beds, armchairs, chest of drawers…… Absolutely amazing! Our shipment of furniture arrived in China on May 25th. The process here is that you have to then give your passport to Customs so that they can clear your shipment. They generally hold this for up to 5 days. Then they check the shipment inventory and ask lots of questions about what you would like to import into China. This can take anywhere from 2-6 weeks. They can also open any box or package to physically check for themselves. Once they have cleared your shipment, you then have them schedule a team to deliver and unpack. That happy day arrived for us on Friday June 22nd. We had to co-ordinate with the management office of our compound to remove all our rental furniture the day before. The team of 8 people arrived at 10am and very quickly got busy unloading the first of 2 trucks that were crammed full of our furniture and boxes filled with toys, kitchen stuff, clothes and other belongings. We had also packed 2 boxes full of UK items such as teabags, toothpaste, shower wash, shampoo, conditioner, British sweeties and marmite. Import toiletries are very expensive in China and so we had stocked up on 2 years worth to bring with us! Day 1 had most of our furniture unloaded, unpacked and placed in the right rooms. Day 2 had everything that we brought from England in our new house by noon. FINALLY, Owen had all his kitchen gadgets back: his knives, pans, coffee machine, meat thermometer and all of his utensils. He was back in action!! Unfortunately, because our packages, boxes and crates were loaded and unloaded so many times, (UK home -> truck -> warehouse -> container -> China Customs -> warehouse -> truck -> China home), we have a few breakages. A couple of them are on things that have huge sentimental value to Owen and I, even if they are not worth so much in real money terms. Oh well, I guess we should be fortunate that it could have been worse and we are covered with insurance. At least we didn’t have anything confiscated either……. We quickly realized that even though we had a lot of furniture we still needed some extra pieces to complete our home here. Luckily it is the season of ex-pat turnover and so lots of families who were moving on were advertising for quick disposal of their belongings. So many people buy extra things when they arrive and then do not have enough room to take them all home (just like us in 2 years time now!!!) Owen has been busy hanging pictures to really finish it off so now our home is complete and it is wonderful to have all our belongings around us. And, at least the windows have black out curtains so it is easy to get the kids off to sleep. We had to give our passports to the Complex managers who have to register us with the local police. Every time we move (ie. a new address) we have to re-submit our passports to re-register with the Police. It is at events/times like this, that I remember where we are and how completely different life is going to be. 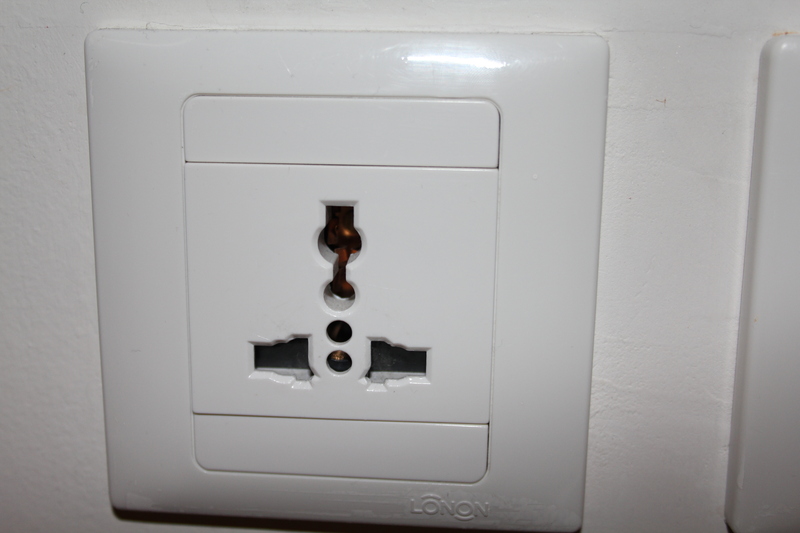 Our apartment has internet connection, but we cannot access Google or Facebook without going through a VPN (Virtual Private Network) – again, another reminder about the difference from the West to China. 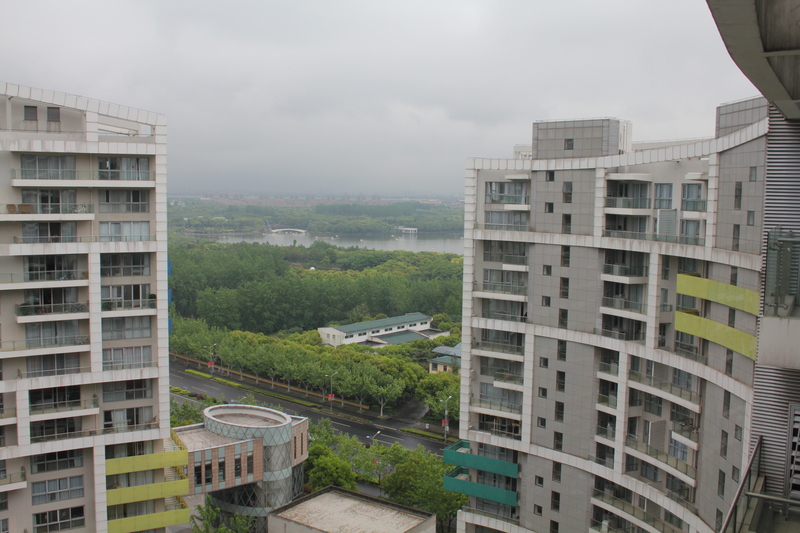 View from our Apartment. 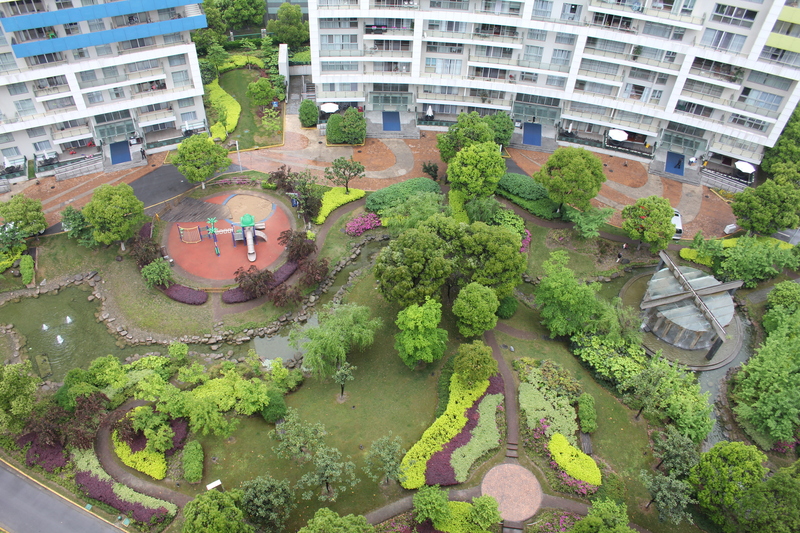 Century Park is just across the road. 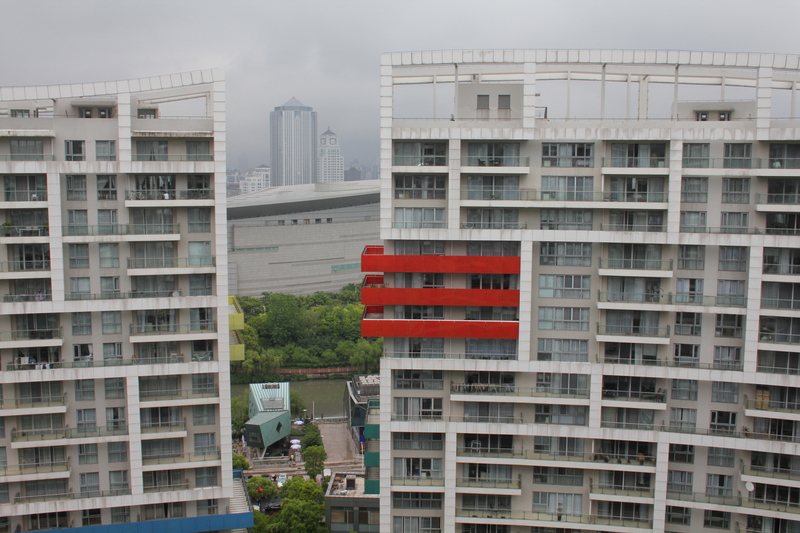 Another view – the Shanghai Science and Technology Museum can be seen here.